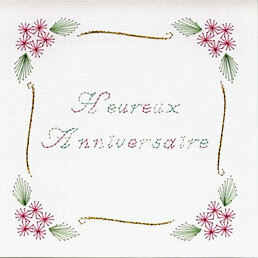 In my previous post I offered a French version of my free PinBroidery flower corners pattern with the words “Heureux Anniversaire” (Happy Birthday). This was produced at the request of Jackie, an English lady living in France. Jackie has now sent me a picture of a finished card so I thought I would share it with you. Jackie says: “This is stitched in Sulky holoshimmer gold and fuchsia thread plus an Indian thread for the green leaves”. If you would like the French pricking pattern for the flower corners embroidery on paper design you can download it from the article below. This entry was posted in PinBroidery and tagged free pattern on Wednesday 18 March 2009 by David Jefferson. lovely card, like the colours, and of course the pattern design is lovely as well.